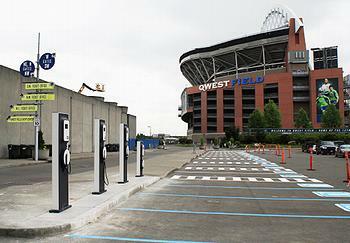 SEATTLE, Washington, June 14, 2011 (ENS) – Seattle’s Qwest Field, home of the Seattle Seahawks football team, is now also home to the city’s first publicly available EV charging stations. This coming season, Seahawks fans can charge their EVs as they’re watching the games. “By the end of the year, more than 1,000 publicly available charging stations will be installed in Washington State, many of them in Seattle,” said Mayor McGinn. Washington is one of six states participating in the public-private EV Project headed by ECOtotality, Inc. The company is in the process of installing 14,000 of its Blink charging stations nationwide. “This summer, customers will be able to use a Blink app for smartphones and other mobile devices to find and reserve the charging stations,” said the mayor. ECOtality began installations of its Blink Level 2 residential charging stations in December 2010 and now has completed some 1,200 installations. Over the past few weeks, the company has begun to install Blink Pedestal chargers in commercial and publically accessible locations in Arizona, Oregon and Tennessee in addition to Seattle. The Blink Pedestal is a Level 2 EV charger (240V) that features an interactive seven-inch color touch screen and web-based delivery via the Blink Network. Installation of the charging stations is a cooperative effort between the City of Seattle, the State of Washington, and the Obama Administration. Funding for the EV Project was provided by a $114.8 million grant from the US Department of Energy. When added to private investment, the total value of the EV Project is approximately $230 million. ECOtality CEO Jonathan Read said, “EV drivers throughout the Seattle metro area and the state of Washington can expect to see more Blink charging stations at convenient locations in the coming months. Together with our EV Project partners we are creating the infrastructure needed to make the Puget Sound region a genesis for EV adoption. Locations for the commercial charging stations were selected using ECOtality’s Micro-Climate planning process, which took into account factors including traffic patterns, the locations of employment centers, regional attractions and retail hubs, as well as the input from regional partners.